Preparing to become a Navy pilot requires a stellar history of academics, leadership skills, athletics, and all-round exceptional characteristics to even get accepted into the Navy pilot program. Once accepted, extensive training begins and can be 1-2 years depending upon the vehicle of choice the young pilot student is selected to join. All pilots are officers. To become an officer in the Navy, you are required to have a college education. Typically pilots are bachelors of science in any of the STEM field. However, that is not a full requirement. You will need at least a bachelor’s degree, earned at a civilian college or university or from the U.S. Naval Academy in Annapolis, Md. In the Navy, you will be commissioned the rank of Ensign first. There are a few ways to accomplish this. 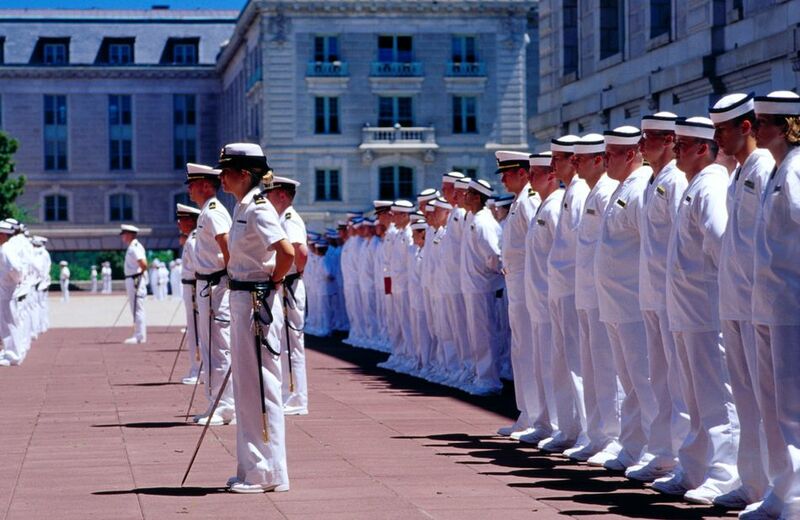 One is to enroll in a Naval Reserve Officers' Training Corps (ROTC) program at a civilian college, which will allow you to attend military classes and drills in addition to a regular college curriculum and requires you to report for midshipman cruises during the summer. If you already have a bachelor’s degree, you can go to Officer Candidate School, an intensive 12-week crash course in military studies held at the Naval Air Station in Pensacola, Fla. You’ll become familiar with the basic rules and regulations of the U.S. Navy, swim a great deal as part of an intensive physical conditioning program, and learn the basics of naval propulsion. The U.S. Naval Academy is the third -- and most rigorous -- route. Only about 1,300 would-be officers (about 10 percent of applicants) are accepted every year. Aspiring students typically have stellar academic records, a history of leadership and often a varsity sports background. You must be a citizen of the United States. If you’re not a citizen yet, you can apply to become one as soon as you enlist, no matter how long you’ve lived in the U.S. There are cutoff ages. You need to be at least 18 years old when you enlist in the Navy and be commissioned as an officer before turning 28. Age waivers might be available. To become a Navy aviator, you will have to pass the Aviation Selection Test Battery (ASTB), a test that has not changed much since its inception during World War II. It consists of five timed subsets: mathematics and verbal, mechanical comprehension, aviation and nautical, spatial perception, and a survey gauging interest in aviation. About 10,000 candidates sit for the exam each year. You’ll have to take a battery of physical, psychological and background tests. You’ll take a flight physical to prove that you’re medically qualified to fly. Your vision can be no worse than 20/40, correctable to 20/20, to become a pilot. You also must be able to swim and comfortable underwater to pass the underwater tests. You can’t be colorblind or have problems with depth perception. The Navy does accept applicants who have had laser eye surgery, however. Unless you hold a recreational or private pilot certificate (or higher) or have completed a solo cross-country flight in a civilian aircraft, you must undergo introductory flight screening. As part of this screening, you are required to take 25 hours of instruction at a certified flight school, completing at least three solo flights, one of them cross-country. Once you’ve accomplished this, you can enroll in the Navy’s program for aviators, initially in Florida. Aviation Pre-Indoctrination:​ For six weeks, you’ll study aerodynamics, aviation physiology, engines and navigation in a classroom setting at the Naval Air Station in Pensacola. You’ll proceed to training that includes learning how to use special devices to cope and survive if an aircraft mishap casts you into the water. Primary Flight Training: ​At Whiting Field in the Florida Panhandle, you’ll start your hands-on instruction with a T-34C, a turboprop painted orange and white that is the Navy’s main trainer. By the end, you’ll have spent more than 100 hours aloft in the T-34 or in flight simulators, learning night flying, flying in formation, aerobatics, and basic flight skills. At the end of primary flight training, you’ll specialize in a particular aircraft. If you’re selected to fly helicopters, you’ll stay at Whiting for six months of training in the Bell TH-57 Sea Ranger. If you’re chosen to fly tactical jet aircraft, you’ll go either to the Naval Air Station in Kingsville, Texas, or Meridian, Miss. Training begins with ground school, including meteorology and more aerodynamics. Then, you’ll progress to the T-45 Goshawk for hands-on training. If you’re assigned to fly the P-3C Orion four-engine maritime patrol aircraft, you’ll train on the T-44A or the TC-12B at the Naval Air Station in Corpus Christi, Texas. Or you’ll go to the Naval Air Station in Kingsville, Texas, to learn how to fly one of two turboprop planes that operate from aircraft carriers: either the E-2C Hawkeye or the C-2A Greyhound. The actual flight time required varies depending on the aircraft but is more than 100 hours in all cases. Do You Have What It Takes to Become a Marine Corps Pilot? What Is The Maximum Age to Become A Military Officer? What Happens During Navy Boot Camp? What Is the Coast Guard College Student Pre Commissioning Initiative? What Restrictions Do You Have During Army Training?